Seats were tan leather with a dark brown dash, a look similar to that in many luxury sedans. Front seats are powered and have three-level heating and cooling and the first two rows of seats are captain’s chairs, so have fold-down arm rests. The third row seats are split and powered, so you can lower them with the push of a button inside the power rear hatch. Both side rear doors are powered and slide, a feature that starts on the Touring model. Pricing is attractive too, with the base LX with its manual rear doors starting at $29,590 including delivery. 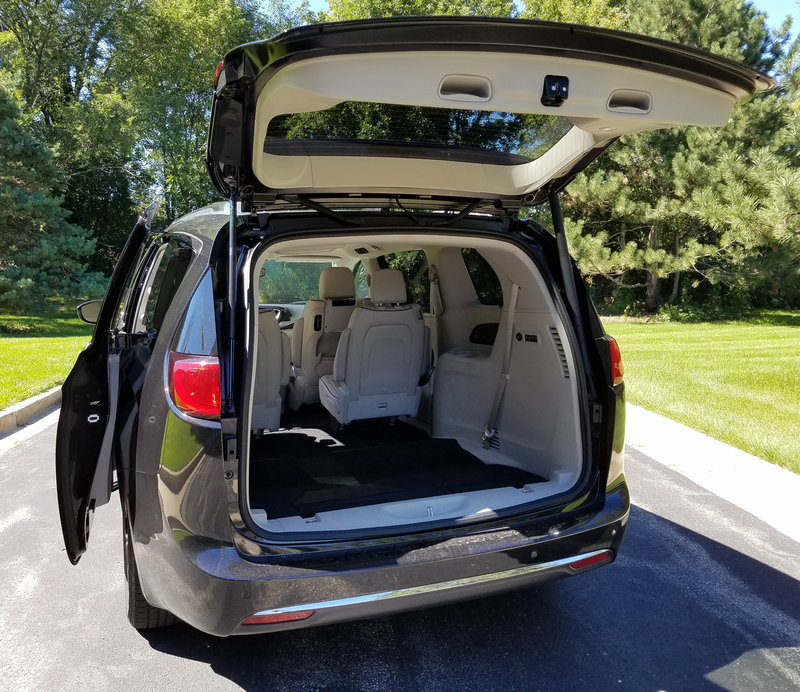 Moving to the Touring model with power side doors pushes the price to just $31,490, pretty affordable for a family needing seating for eight. For that you’ll need the second and third row bench seats. 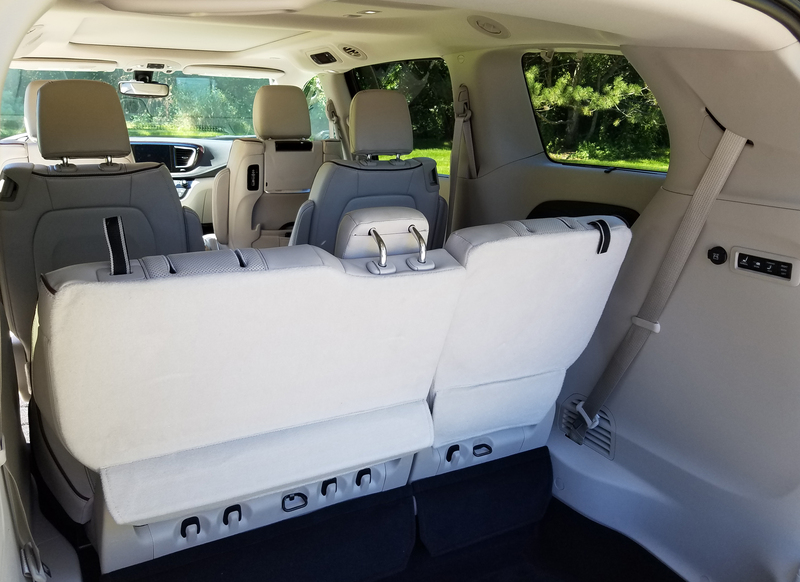 Oh, and you’ve likely heard of Chrysler’s Stow N Go seats in its minivans’ second row. These are great for kids’ car seats and also fold down into the van’s floor if you need to use the vehicle for hauling large objects. That third row was power Stow N Go in the test van too, but when that row’s seats are deployed it creates a deep storage area behind the seats for cargo. Amazingly, all the seats are fairly comfortable too, the third row is best for shorter legged riders, but adults can squeeze in if need be. Quiet is a big plus here too. 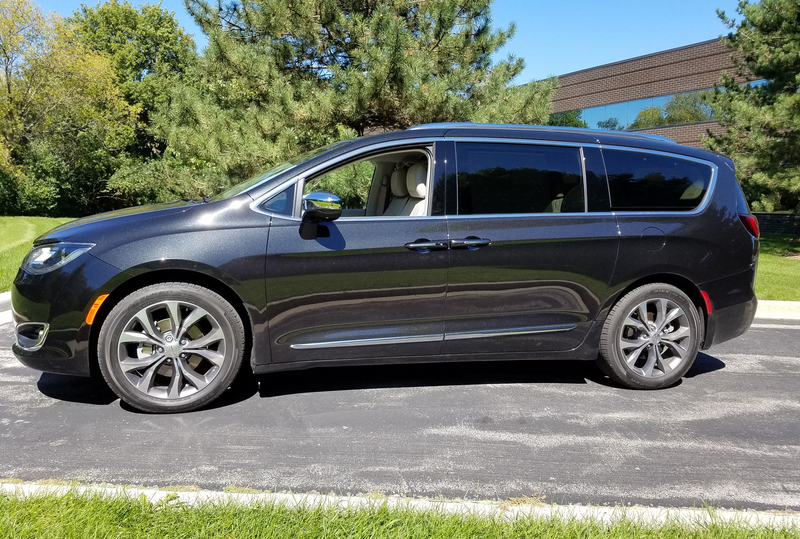 I drove across country in a Honda Odyssey this summer and I can vouch for the Pacifica’s interior being much quieter than the Honda’s. Little road noise or rumble here, so you can hear the kids kibitzing in the rear seats. 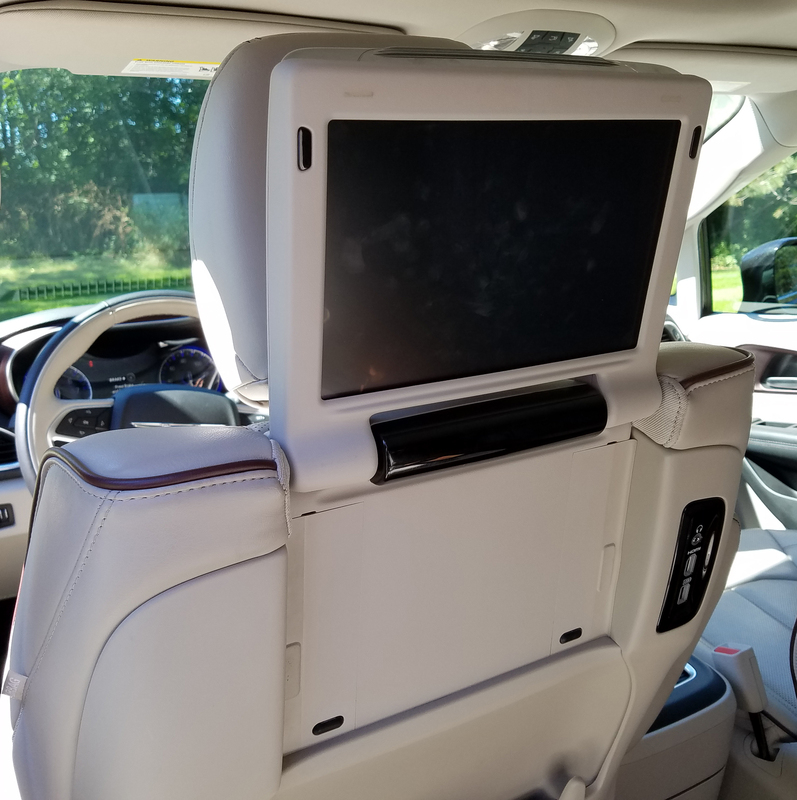 They can be calmed though, with a $1,995 Uconnect theater package that includes a fine video system built into the front row’s seatbacks. This system can accommodate your own games or videos, an iPhone’s games or a selection of built-in games. My 7-year-old grandson got a big kick from exploring the games that already were in the system as we drove about town. Wireless headphones are included, so mom and dad and/or the grandparents can be blissfully unaware of any gaming noises, or rowdy music. Chrysler’s video system for the youngsters in rows 2 and 3. The tested Limited also comes with a giant sunroof that spreads over the first two rows’ seats and includes a sunshade. It lightens up the interior considerably. There’s also a sunroof over the third row seat, so the wee ones in back can catch some rays too! An aside, the panoramic sunroof cuts seating capacity to seven as it eliminates the overhead seatbelt anchors for the middle position in row two, if you have a bench seat. Yet it’s not just the leather seats and sunroof that deliver a luxury feel here. The armrests and doors feel soft and rich, controls are soft-touch too. The main gauges are well laid out too and feature blue backlighting while the main dash screen and controls are easy to get at and use. Pacifica’s thick (really too thick) leather steering wheel also is heated, but includes a metal inlaid trim ring on the Limited that remains cool to the touch. That won’t be good in winter and really is unnecessary, just styling glitz. 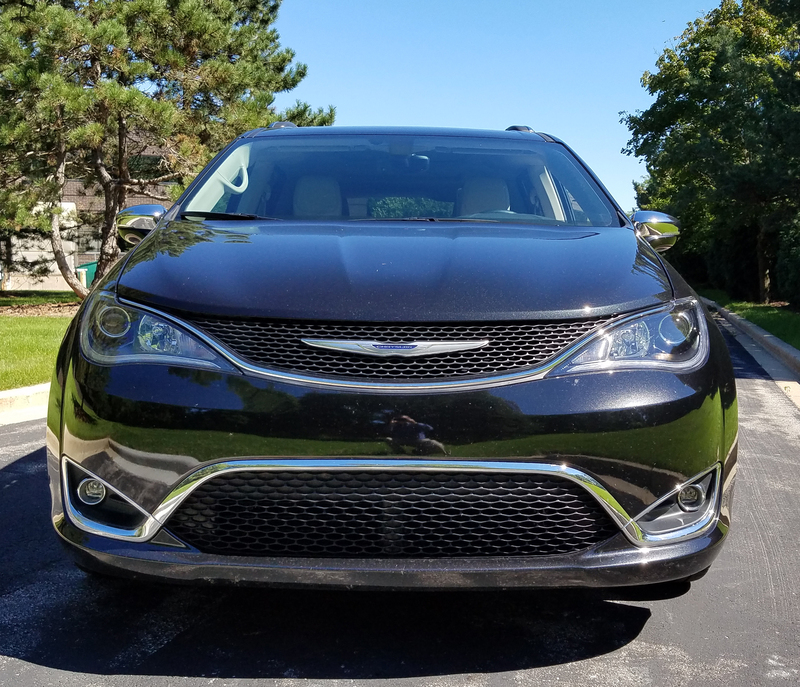 The Limited also includes a blind-spot warning system, cross-path detection, rear park assist, adaptive cruise control, remote start, and Sirius satellite radio and traffic alerts too. Like a minivan, but with better than average power, ride and shifting. The 3.6-liter V6 with variable valve timing delivers 287 horsepower and a torque rating of 262. Is it quick? No, it’s a 4,330-lb. minivan, but the 9-speed automatic transmission uses the power well and shifts smoothly. It’s controlled by a dial on the dash, not a shift lever. My only complaint here, as with more and more vehicles of late, is a noticeable hesitation when you hit the gas pedal before that power kicks in. No turbo here, so that’s not the culprit. Ride is above average, well-controlled and well cushioned. The whole family will feel like they’re riding in a tall entry-level luxury sedan, and there’s nothing wrong with that. Standard are 17-inch wheels, but the test van went with 20-inchers that give this a little more muscular look. Handling is predictable with a little play in the wheel, and a fairly heavy steering feel. But the van is easy to control and never a burden, except maybe trying to slip into a tight grocery store parking lot. 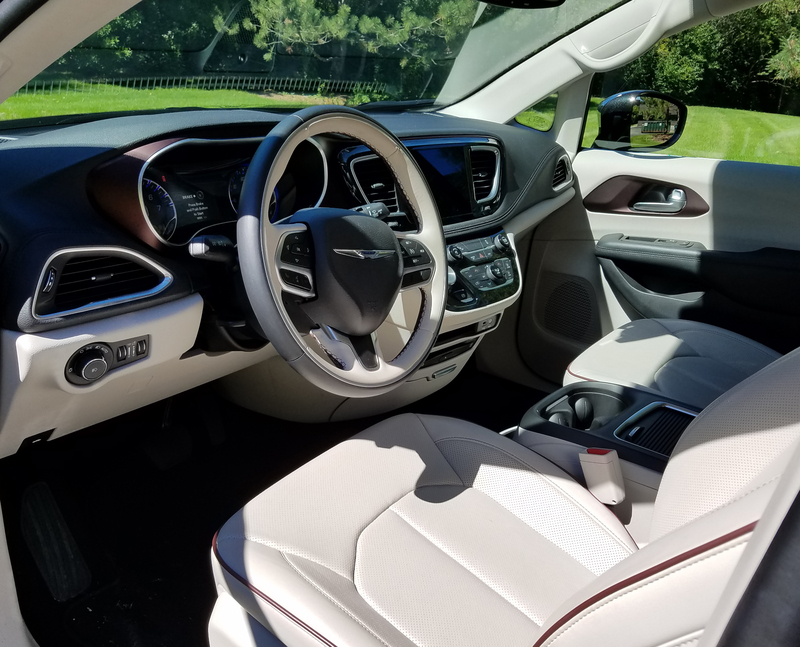 Sharp-looking interior, a Chrysler strong point. Gas mileage is as among the best in the minivan market, with an EPA rating of 18 mpg city and 28 mpg highway. I go 18.8 mpg in about a 50-50 mix of city and highway and not loaded down much. If the base LX or Touring models don’t suit your needs, or you desire the more upscale finery that’s available, you can move to a Touring L at $35,490, a Touring L Plus at $38,890 or the tested Limited at $42,495. All that is in line with its competition, especially once you load those up the way you’ll want them. The test van settled at $46,480 including a $995 delivery fee. 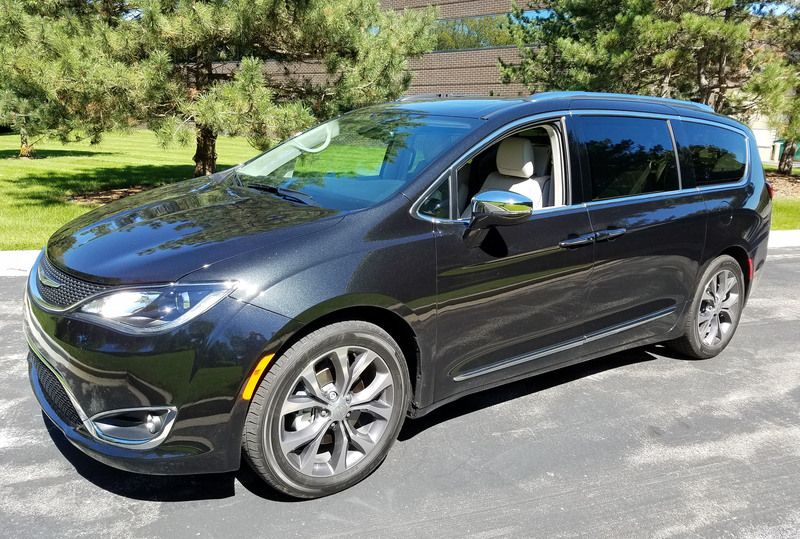 Certainly the import minivans offer all the bells and whistles too, but the new Pacifica offers the quietest interior, plus a fine ride and good power – enough that the imports will need to up their game in the near future. Hits: Streamlined nose and better overall looks, quiet luxury-feel interior, roomy with big sunroof over front 2 row seats and smaller one over third row, power-down third row seats, power hatch and sliding side doors, heated steering wheels, heated/cooled front seats, blind-spot warning, blue back light on main gauges. Plus nice ride, smooth shifts and good power. Misses: Heated wheel has cold metal inlaid trim, thick steering wheel and hesitation before acceleration.